Back in the saddle after a little timeout, had a little mishap with a nasty virus (the computer kind). That thing basically ate my little mini-notebook alive leaving me on the road without a keyboard, mouse or usb port in sight... weird. 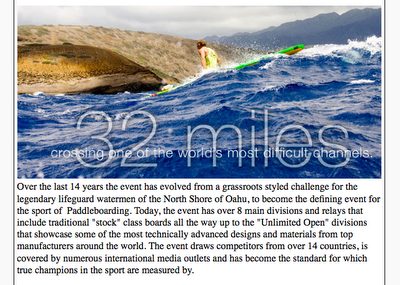 I really like keeping this blog fresh and updated so I'm happy to be back and at it. 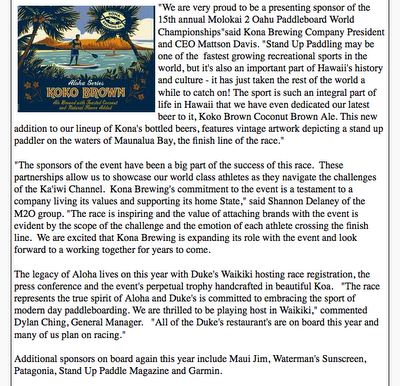 Hats off to the Kona Brewing Company for stepping up and sponsoring such an awesome event. You'll remember that Kona was also a headline sponsor at last year's Battle of the Paddle Event in Dana Point. 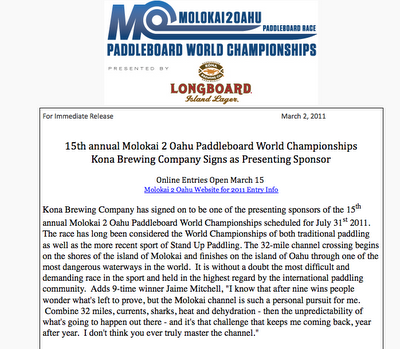 It's good to see that there are companies out there who value and support the tradition of endurance water sports like this race and major stand up paddle events. I'm a big fan of their craft beers- look for my upcoming "ride report" of their Koko Brown. I like da kine Castaway IPA!